Sinister thrills await in this gorgeously dark and unsettling telling of a real-life ghost story from New Orleans' shadowy history. Free trapped spirits, cast spells and unlock fragments hidden in the paranormal world to reveal the story of a misguided voodoo queen. I am Edward Blackgate, proprietor of Everlasting Life. It is my pleasure to introduce you to the charming residents of my funerary amusement park. They have all been interred by invitation only, as they each have a ghastly story to tell. Join me on a journey back in time as you reveal the dreadful secrets behind one of my most fascinating occupants. Explore 26 eerie seek & find locations brought to life by optical illusions and paranormal activities. Fuse hidden objects, foraged plants and spirit riddles to cast potent spells and overcome obstacles in your path. Immerse yourself in the history and secrets of 19th century New Orleans. 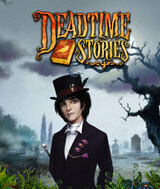 Become part of the story through gorgeous art, character voiceovers, animated scenes and ghost encounters while you play .